95 years ago to the day, the April weather around Arras was utterly miserable. Unseasonably low temperatures combined with snow, sleet and driving rain to transform the area around the beleaguered French town into a muddy hell. The incessant shelling had pulverised the already unstable ground, creating a sea of mud that was to form the backdrop to the first major Allied offensive of 1917. The Battle of Arras was part of a three-pronged assault on the German lines. Away from the wretched, eponymously named town, the Canadians would launch an attack on the German defences on Vimy Ridge and the French would hurl themselves at the deeply entrenched positions on the Chemin des Dames, as part of the ill-fated Second Battle of the Aisne. The attacks would yield mixed results. The Canadian’s superbly planned attack on Vimy Ridge would be an outstanding success, indeed the manner of victory, as well as the skill and courage shown by the Canadians, became a huge source of pride for the country, so much so that Vimy is often considered to be the ‘birthplace of the Canadian nation’. The British would also perform well at Arras. Commanded by General Allenby, the Third Army achieved good initial success, advancing up to three miles in places and successfully overcoming the German front-line defences. However, the inability of Allenby to push home the success meant that in the end the Germans were able to recover their composure and check the British advance. On the Chemin des Dames, the story was quite different. The battle was an abject failure. The Germans were already aware of Nivelle’s plans, having captured them some two weeks earlier, and the French made little or no progress. The failure was to cost Nivelle his job and cause the Poilu to finally snap. Mutiny swept through the French armies, something that remarkably was not picked up by the Germans. 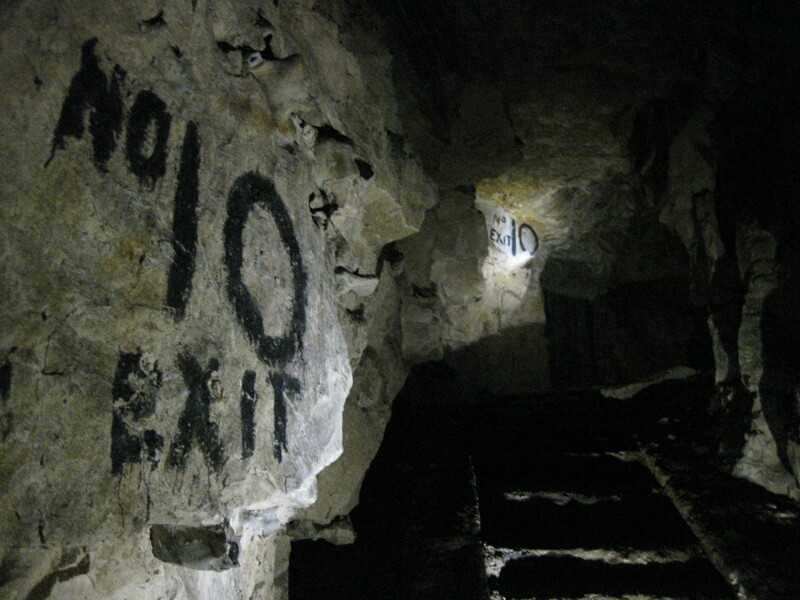 The initial British success at Arras, the Canadian victory at Vimy Ridge and the grotesque charade on the Chemin des Dames all had their roots in the subterranean worlds that underpinned their respective battlefields. On the Chemin des Dames, it was the Germans that took advantage of the many caves and souterraines that lay beneath the steep ridge. They hid their men there during the opening bombardment and then, when the French attacked, they were able to appear from below ground and fire from the slopes of the ridgeline, catching the French in a murderous crossfire, with devastating consequences. At Vimy, the British tunnelling companies had worked tirelessly during 1916 to win the mining war on the ridge. This they had done with aplomb. Extensive defensive systems had been created enabling the Canadians to attack from a sure footing. 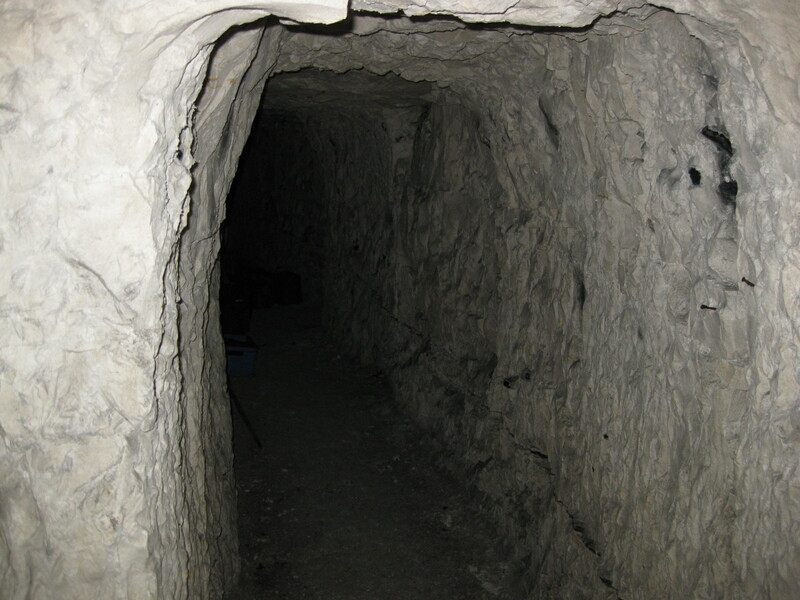 182 Tunnelling Company had also prepared several large mines, but in the end these were not used during the attack on the ridge, such was the speed of the infantry’s advance. However, special wombat mines had been prepared in advance. These were holes drilled horizontally towards the enemy, about 3-6 metres deep, which were packed with explosives that would create a deep, protective trench in No Man’s Land. Blown once the initial attack had started, these trenches then allowed for the removal of casualties and for communications to be improved with the forward positions. One of the many tunnels linking the quarries. Photograph by Matt Leonard (CC-BY-NC-SA). Tunnellers and tools, Arras. Photograph by Matt Leonard (CC-BY-NC-SA). At Arras, too, the tunnelling companies had been busy. The town was sat on top of numerous subterranean quarries, some dating back to the medieval period, that had been utilised by the French since the beginning of the war. In 1916, the British took over the Arras sector of the line and immediately set about expanding the quarries and linking them with passages and tunnels. By the 9th April 1917, this underground world had become a fully functional platform from which to attack the German positions. Not only had the quarries and caves been expanded to deliver men directly to the frontline trenches in safety, but also this subterranean void now contained kitchens, latrines, washing facilities, a small gauge railway, command and control centres and even a 700-bed hospital. On the eve of the Battle, the hidden world beneath Arras was able to accommodate up to 24,000 fully equipped soldiers, almost directly below the frontlines. The ability to deliver men like this, straight to the forward positions, proved to be a major step forward from the year before, when many of the casualties on the opening day of the Battle of the Somme had occurred far from the sight of the enemy, as men made their way to their forward positions. 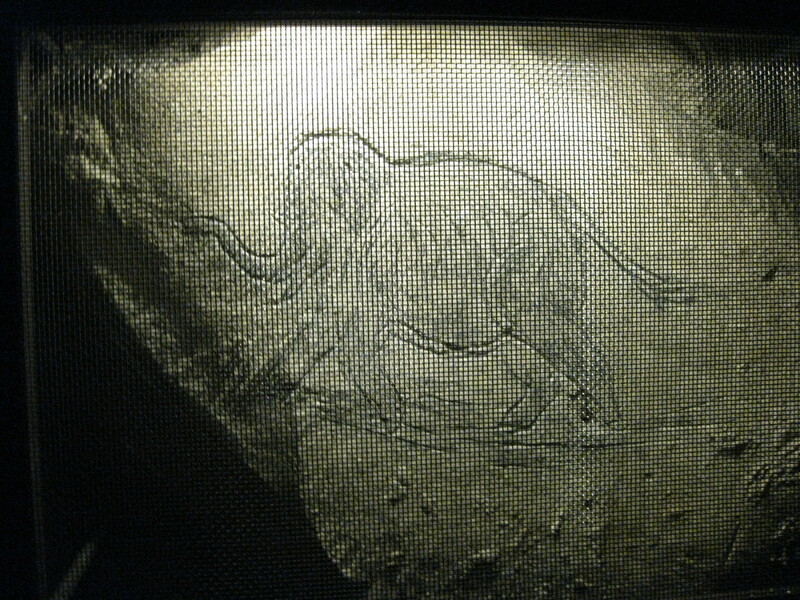 Mammouth carving, Wellington Mines. Photograph by Matt Leonard (CC-BY-NC-SA). 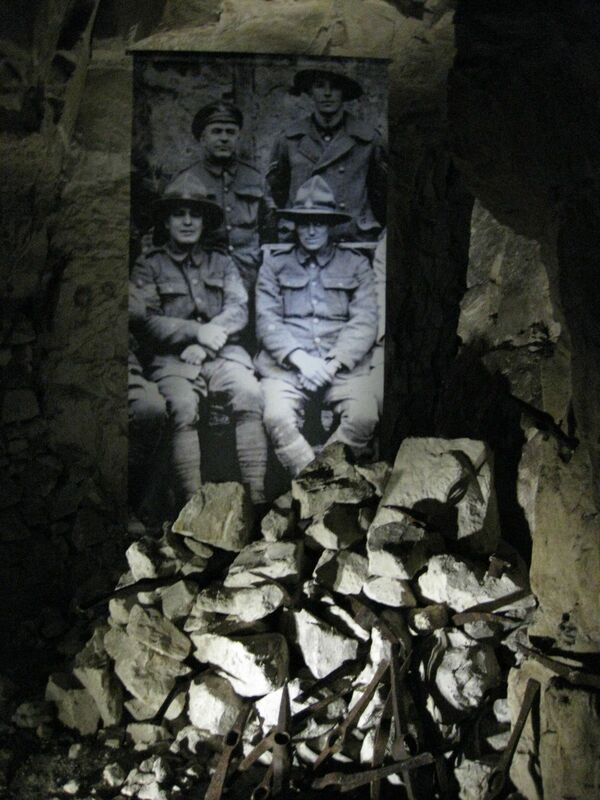 The majority of the tunnelling and cave extensions beneath Arras had been carried out by the New Zealanders and accordingly the quarries and caves had been given names such Auckland, Christchurch and Dunedin. One of these, the Wellington Mines, is now open to the public; it is a subterranean museum that captures a moment in time. On the walls can be found items of graffiti and intricate carvings that contain the distributed personhood of their creators. These unique items of Great War material culture range from simple inscriptions detailing name, rank and unit, to drawings of women, pictures of kings and even a carving of a woolly mammoth (or perhaps an elephant). The walls are also adorned with unique inscriptions left by Maori tunnellers, often in their native language, which tell of the global nature of the conflict, as well as their journey through it. Intermingled with these personal markings are signs directing the occupants to different parts of the vast cave network, some of which point upwards – indicating the chalk steps that lead from the underworld up to the surface, to a man-made hell on earth and a battle, that having started so promisingly, soon bogged down into the usual stalemate of trench warfare. Exit to Hell. 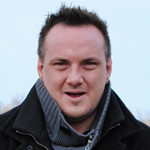 Image is authors own. CC-BY-NC-SA. This entry was posted in From Space to Place, The Battle of Arras and tagged 355 (Military science), 356 (Foot forces & warfare), 940 (General history of Europe), Blogs, distribution, UD (Infantry), UG (Military engineering. Air forces). Bookmark the permalink.